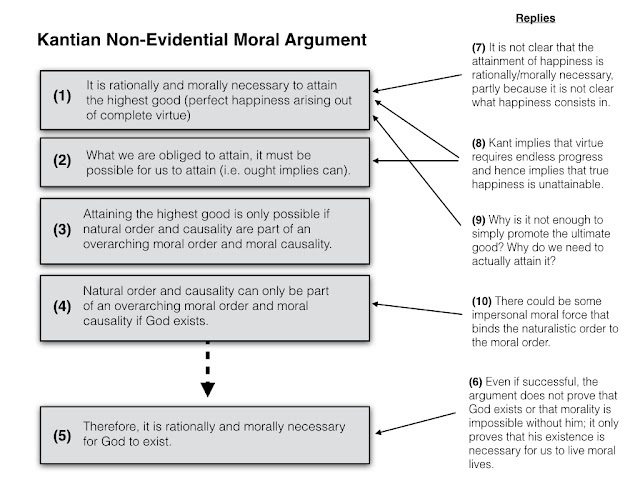 Evidential Arguments: These are arguments that highlight the existence of some moral fact (E) and argue that God is the best explanation of E. This provides some support for the existence of God. 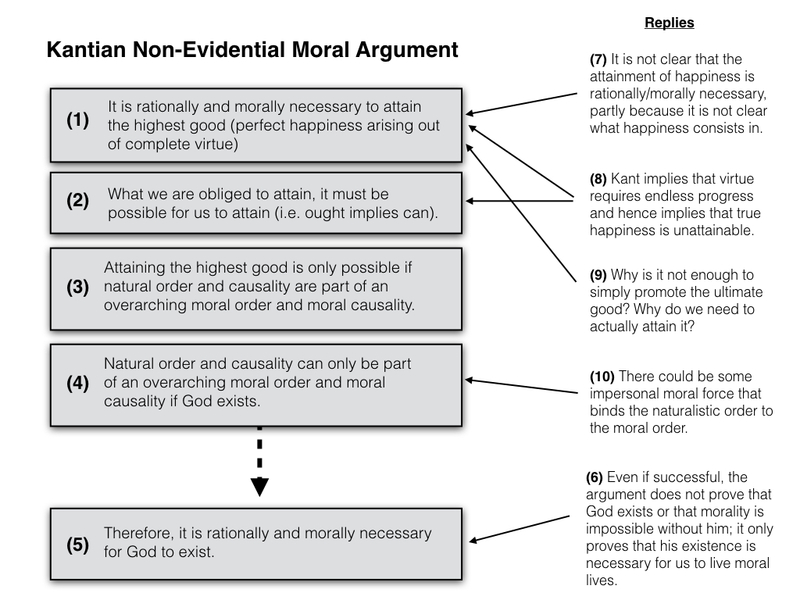 Non-Evidential Arguments: These are arguments that highlight some moral goal or end and argue that God’s existence is necessary if that goal or end is to be achieved. We looked at evidential arguments and their problems in part one. Today we’ll look at non-evidential arguments. Once again, I’ll be taking my lead from Peter Byrne’s article ‘Kant and the Moral Argument’, which is to be found in Jeffrey Jordan’s book Key Thinkers in Philosophy of Religion. Since Kant is himself a proponent of a non-evidential argument, and since Byrne’s essay is ostensibly about Kant, it is not surprising that the analysis of Kant’s argument takes up more space in Byrne’s article than did the analysis of the evidential arguments. I tend to find non-evidential arguments less interesting, for reasons that will become apparent, but I am trying to be sympathetic in my summary/commentary. …Evil and wrong will be punished; righteousness will be vindicated. Despite the inequities of life, in the end of the scales of God’s justice will be balanced. Here, Craig is identifying a moral goal that needs to be satisfied if moral life is to be possible. He is then suggesting that it is not possible without God. The problem with atheism is that life ends at the grave. I could be a total moral jerk my whole life and not be punished for it; I could be a total moral saint and suffer needlessly. The morality or immorality of my behaviour need have no bearing on my ultimate fate. That seems wrong to Craig. Morality should count for something in the end. (2) What we are obliged to attain, it must be possible for us to attain (i.e. ought implies can). (3) Attaining the highest good is only possible if natural order and causality are part of an overarching moral order and moral causality. (4) Natural order and causality can only be part of an overarching moral order and moral causality if God exists. (5) Therefore, it is rationally and morally necessary for God to exist. Byrne doesn’t actually provide a conclusion in his version of the argument. I have done so because I think the argument needs to reach some sort of conclusion, even if it turns out to be a misleading or unimpressive one. Let’s now consider some objections to this Kantian argument. (6) Even if successful, the argument does not prove that God exists or that morality is impossible without him; it only proves that his existence is necessary for us to live moral lives. There are unsubtle and subtle aspects to this. The subtle point is that this argument does not rule out the cognitivity of moral propositions in an atheistic universe. For all this argument says, it could be true that propositions like ‘torturing cats is wrong’ and ‘friendship is good’ are true and God not existent. In other words, it is possible to accept this argument and still be an atheistic moral realist (i.e. someone who believes that moral facts do not depend on God for their existence). (5*) Therefore, it is rationally and morally necessary to believe in God’s existence. And this throws open the possibility of believing in God as a useful moral fiction. The theist would resist this, no doubt. They would point back to the first premise and argue that mere belief is not enough: we have to have the possibility of attaining the highest good and this means we need God to actually exist, not just exist in our minds. This runs into the promotion vs attainment objection that I discuss below. (7) It is not clear that the attainment of happiness is rationally/morally necessary, partly because it is not clear what happiness consists in. This is an attack on premise (1). Byrne explains the objection by pointing out that the nature of happiness is contested and, depending on which definition you adopt, people often give up the pursuit of happiness for the attainment of other goods. So, for example, if happiness is understood as hedonistic pleasure, it seems true to say that people will subject themselves to displeasurable states of affairs in order to attain other goods. I might hate studying for exams, for example, but I accept the displeasure in return for an education. A better example, and one given by Byrne, is that of someone giving up their career to care for a sick relative. The former made them happy whereas the latter does not, but they find the latter more rationally and morally compelling. 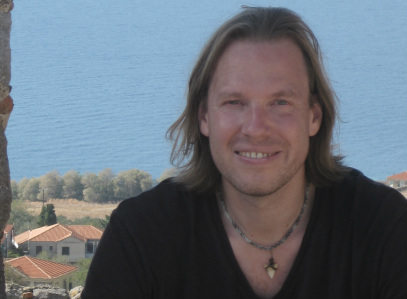 Byrne detects three distinct accounts of happiness in Kant’s work: a pleasure-based theory; a contentment-based theory; and a desire-satisfaction based theory. The problem is that these three theories pull in different directions. It is possible that the pleasure-filled life is not the life in which the most desires are satisfied. I often pursue momentary pleasures at the expense of long-term desire satisfaction. Does this make me more or less happy? Likewise, contentment is a very different notion from pleasure or desire-satisfaction. I can be content with my lot in life and not experience much pleasure. The point here is that happiness is a deeply contested concept and given its deep contestation its not at all clear that it’s attainment is rationally and morally compelling. For what it is worth, I’m not sure that this is a good objection. The mere fact that there is uncertainty as to what a goal consists in does not mean that it is not morally or rationally necessary. We may simply need a wide and capacious understanding of what it is. On top of it, it feels intuitively correct to suggest that the pursuit of happiness (understood broadly) is the ultimate goal of human life. But this is to speak only to happiness and not virtue. For Kant, it was essential for virtue and happiness to align, i.e. for true happiness to be only attainable by living the morally virtuous life. For this, God was deemed essential. I previously mentioned that in an atheistic universe it seems eminently possible for someone to live an immoral and vicious life and yet to be happy (in some sense of the term). This is the great fear of theists like Kant and Lane Craig. They think God is necessary to ensure some alignment between virtue and happiness. (8) Kant implies that virtue requires endless progress and hence implies that true happiness is unattainable. This is contrary to premises (1) and (2) of his argument. Virtue is always in progress and yet always starts again from the beginning. The first point holds because, considered objectively, it is an ideal and unattainable, even though it is a duty to approximate constantly to it. And in the Critique of Practical Reason, Kant suggests that virtue (or what he there calls ‘holiness’) requires immortality because it involves the constant asymptotic approach to a perfect ideal. This seriously undercuts the non-evidential argument because it suggests that even with God it is impossible to attain true happiness. Immortality seems to be doing all the work; not God. (9) Why is it not enough to simply promote the ultimate good? Why do we need to actually attain it? One should always be wary of objections phrased as rhetorical questions, but in this instance the question seems like a good one. Surely we can respect the need for some moral ideals, perhaps we can even accept that having those moral ideals in mind is necessary if we are to live moral lives, but why is it morally and rationally necessary to actually attain them, particularly if this is ultimately impossible? The second premise of Kant’s argument puts down his famous ‘ought implies can’ principle. It states that we are only morally obliged to do that which it is possible to do. Well, it is possible to promote moral good; but it may not be possible to achieve moral perfection. This suggests that the former is what is rationally and morally necessary; not the latter. This, therefore, undercuts the first premise of the argument. (10) There could be some impersonal moral force that binds the naturalistic order to the moral order. In other words, we don’t need the Western, personal, monotheistic God in order to ensure that moral goals are attainable. All we need is some impersonal moral force. Some Eastern religions believe in such forces, e.g. karma. Of course, the tenability of this objection depends very much on the plausibility of this metaphysical view. Somewhat ironically, whether you believe in the possibility of impersonal moral forces is likely to depend on how you feel about evidential moral arguments (the kind of arguments discussed in part one).